Kundalini yoga emerged from the meditative practices of ancient Hindu India, possibly as long as 4,000 years ago. Kundalini yogis believe that Kundalini is a primal energy that we are all born with. Located at the base of the spine, it is a transformative energy that we can all learn to activate and that, when awakened, can expand your awareness, enhance both physical and emotional wellbeing and inspire you to achieve excellence. Kundalini Yoga works directly with this Kundalini energy and combines asana (physical postures), pranayama (breathing techniques), movement, stretching, mantra (sacred sounds), mudra (hand positions) and relaxation. Exercises, kriyas (sets) and meditations stimulate the glandular system, strengthen the nervous system, expand the lung capacity and purify the blood. It was brought to the West from India by Yogi Bhajan in the 1960s, and is today practiced all over the Western world. What can Kundalini yoga do for you? Practicing Kundalini yoga keeps the body in shape and trains the mind to be strong and flexible in the face of stress and change. It increases oxygen and blood flow, balances the glandular system, strengthens the nervous system, and reduces stress-induced toxins such as adrenaline and cortisol – beneficial when you’re trying to navigate life in this accelerated and fast-paced world. Kundalini also has a vast repertoire of Kriyas and Meditations that can target problem areas in your everyday life, such as fear, depression, anxiety, fatigue, anger, break-ups, loneliness and sadness. Research is now showing the benefits of Kundalini’s powerful and breath-controlled meditations for treating a range of health complaints, from depression and anxiety related disorders to heart problems and memory lapses. The US Alzheimer’s Research and Prevention Foundation prescribes one of Kundalini’s Kriyas – the Kirtan Kriya – as a way to improve brain function, emotional balance, focus and memory. Perhaps most importantly, Kundalini yoga takes you away from the chatter of daily life to a place where you can experience real freedom and stillness, opening your mind to inspiration, excitement and new possibilities. Once we awaken Kundalini energy, we raise our energetic vibration to release stress and allow our mind to come back to peace and balance. For most of my career I have performed around the world as a professional opera singer, practicing various styles of yoga as a tool to keep calm and centred. 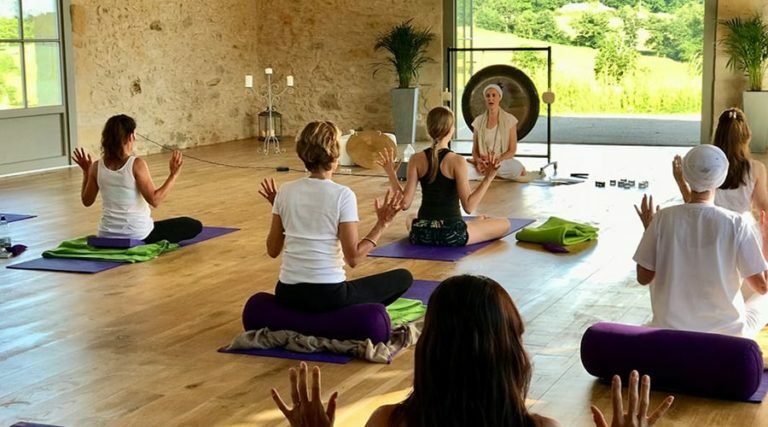 My first experience of Kundalini yoga – on a retreat in Mexico – took me way beyond the benefits of the other type of yoga I had been practicing. I was burnt out from a busy schedule of singing and touring, searching for some inner peace, balance and a greater sense of connectedness. But after my very first Kundalini class, I knew I’d found what I was looking for, and my practice has benefited me personally in so many ways since then, making me calmer, happier, more energised and more creative, transforming my relationships, supporting me in my performing career and helping me keep up with my young daughter. How can you establish your own Kundalini yoga practice? The beauty of Kundalini yoga is that you can experience the benefits in a very short time. It’s very accessible and doable, even if you have a busy life, and a regular practice will help you feel happier, healthier, more energised, and be more creative, productive and relaxed. Start slow, find an exercise that resonates with you, whether that is with breath, mantra or movement, and commit to at least 5 minutes a day. A meditation is a good place to start and Kirtan Kriya (page 130 of my book, ‘Everyday Kundalini’ ) is a simple and effective meditation. If you can find a class nearby to where you live, this will inspire you to keep up with your daily practice. The post On Kundalini yoga appeared first on Queen of Retreats.